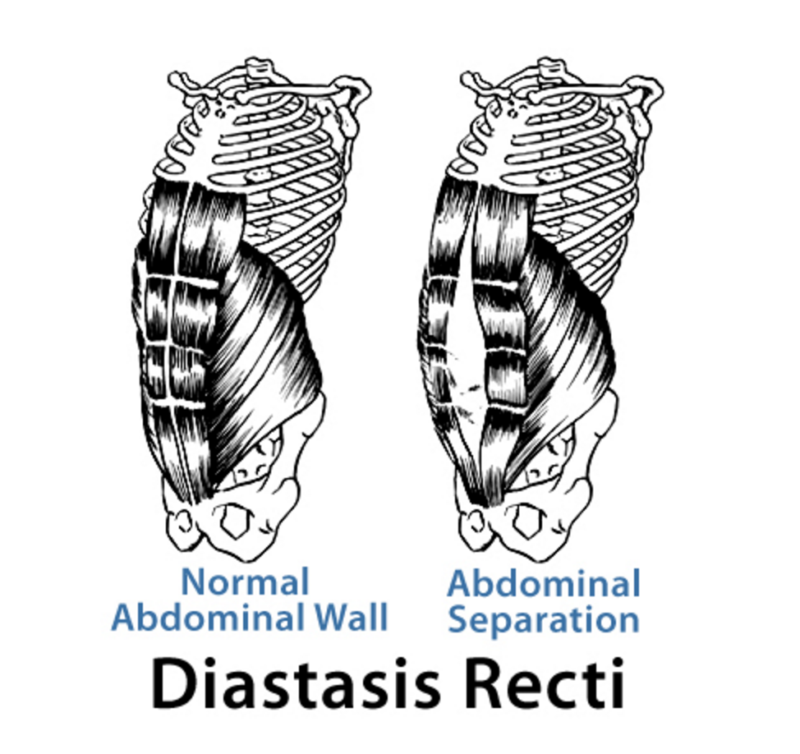 Diastasis Recti (DR), also known as abdominal separation, is a condition where the rectus abdominis (the large abdominal muscles) separate. DR can occur on both men and women, but is most commonly seen among women during the later stages of pregnancy, or during birth when pushing to deliver the baby. Very rarely are women educated about DR by any health or fitness professional she sees during her pregnancy or postpartum recovery. The lack of information and guidance post pregnancy is extremely concerning, disappointing and incredibly surprising! The latest research shows fifty-three percent of new moms have DR immediately postpartum. (Boissonnault & Bleschak) This percentage may be even greater among women over 35 years old or who have had multiple pregnancies. DR is so common, yet many women have never even heard of it, let alone know how to test for it and treat it. So let me help you out by showing you a simple self-test you can do at home to find out whether or not you have any DR because this is the FIRST THING you need to do, and know, before returning to ANY form of postpartum exercise. *Note: I recommend waiting until you are at least 4-6 weeks postpartum to perform this test. Lay on your back with your knees bent, and your feet flat on the floor about hip width apart.. Slowly lift your upper body off the floor into a “crunch,” while bringing your ribcage down toward to your pelvis. Move your fingertips back and forth across your midline, feeling for the right and left sides of your rectus abdominis muscle. You will want to go all the way from your pubic bone up to your sternum testing for separation at, above, and below your belly button. A gap of more than two to three finger-widths when the rectus abdominis is fully contracted. The gap does not shrink, or come together, as you contract your abdominal wall. The most important thing to be aware of is that if your DR is left untreated, or you are unaware you have any DR, your body will be forced to rely on other muscles to help stabilize your pelvis during any daily activity or postpartum exercise you perform. “Mummy Tummy” or “Belly Pooch” that just WON’T GO AWAY!! The sad thing is, Roxanne’s story is not uncommon. The GOOD news is, this doesn’t have to be YOU! I am so glad you are here reading this blog and taking your postpartum recovery seriously. I congratulate you for educating yourself and wanting to make sure you are doing things as safely and effectively as possible. Your body will thank you for it in the long run … I can promise you that! This is important stuff so if you don’t feel confident, or are not really sure if you are performing this self test correctly … don’t worry, I’ve got you! Jump on over to my calendar and schedule a FREE 20 min Zoom Call with me. I will personally guide you through it. You NEED to know this so you can take the proper precautions and progressions in your postpartum fitness journey to feel the best you can as a new mom. Schedule a FREE 20 Minute Zoom Call with Me ==> CLICK HERE! This entry was posted in Postpartum Fitness and tagged Diastasis recti, Diastasis Recti Test, Fit Mommy Method, Kristy Lee Wilson, Kristy Wilson, Post Baby Workouts, Postpartum Fitness, Postpartum Workouts, Safe Postpartum Exercises.